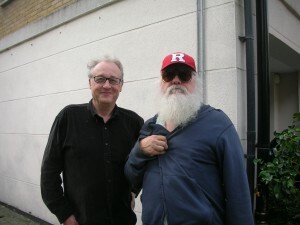 The last time I saw R Stevie Moore was in September 2007. After many emails and phone calls, getting lost on my cumbersome police motorcycle on the highways of New Jersey, I arrived 4 hours late but was still given a warm welcome – we chatted into the evening, Kris, his parter made me some dinner and Steve and I unfurled our sleeping kit and lay on the studio floor together as he told me he snored and we would sleep in the studio so Krys would not be disturbed. A CD was produced which played on repeat all night – white noise – it was the only way I can get to sleep – Stevie said. 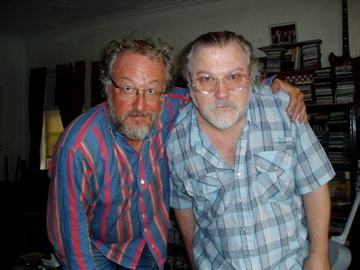 Late 2010, Steve left Bloomfield New Jersey, his home with Krys for 30 or so years and found his way back to Nashville – the town he grew up in – this time, he was homeless. This was to be a blessing, or so it seems, as he re-made and made friends eventually being approached by John Demiglio, a film maker who suggested a documentary on Steve, on one condition; that he would organise a world tour for Steve, along with the Band Tropical Ooze. Earlier this year, I heard of the plans for the world tour as the money to do the project was raised on line through Kickstarter.com. I got in touch with Mr. Moore and he agreed to meet up in London. I was very fortunate as the itinerary for the tour left us very little elbow room. At 2.15 the tour van rolled up on the last day of the European leg of the tour in Borough High St and we recorded this special edition of Outsider In before they rushed over to do a sound check at the Lexington in Islington. I put Stevie and the band up in my house (luckily nearby) after the gig. We all had breakfast together – Stevie seemed tired and withdrawn; I guess he was saving his energy for the stage – and it was a superb gig he played the night before. I gave them a hug and waved them off as they went to fly back to the USA to do a final West Coast tour which should prove to be amazing – Ariel Pink is going to play live with Stevie and that is really something to look forward to. This entry was posted in Outsider In, Shows and tagged Ariel Pink, Bloomfiield, James Tregaskis, Krys O., Nashville, R Stevie Moore, RSTVM on August 17, 2011 by jtreg. Largely unappreciated musician and composer Robert Stephen Moore born in Nashville in 1950, matured in New Jersey and now returned to his home town again in 2010, penniless and homeless – will you help him at Christmas? Why not join us and help Steve by sending some money via PayPal to rsmko@comcast.net, that’s rsmko@comcast.net… He really needs the help. original broadcast 2.20pm on Boxing day – Listen to exclusive recordings of the good man, presented by James Tregaskis. This entry was posted in Outsider In, Shows and tagged Ariel Pink, Homeless. Krys O., Lane Steinberg, Nashville, Outsider, WFMU on December 28, 2010 by jtreg.